If you have never been to the Miniatur Wunderland in Hamburg, Germany, it is worth a visit. It is an amazing place, where the attention to detail is mind boggling. This picture (above) I took of the historical diorama showing a herd of people moving through a Berlin Wall passage feels like a good visual metaphor for uncontrolled, heavy data traffic. Moving data to Tableau via FileMaker’s Data API (using the Web Data Connector) can be a bottleneck if you’re doing a full extract, especially the more often you do this. So, let’s look at some better ways to take control of this, limit data in extracts, and maybe add some automation. As a manager, let’s say you want look at something like this on a daily basis — perhaps for the prior day. 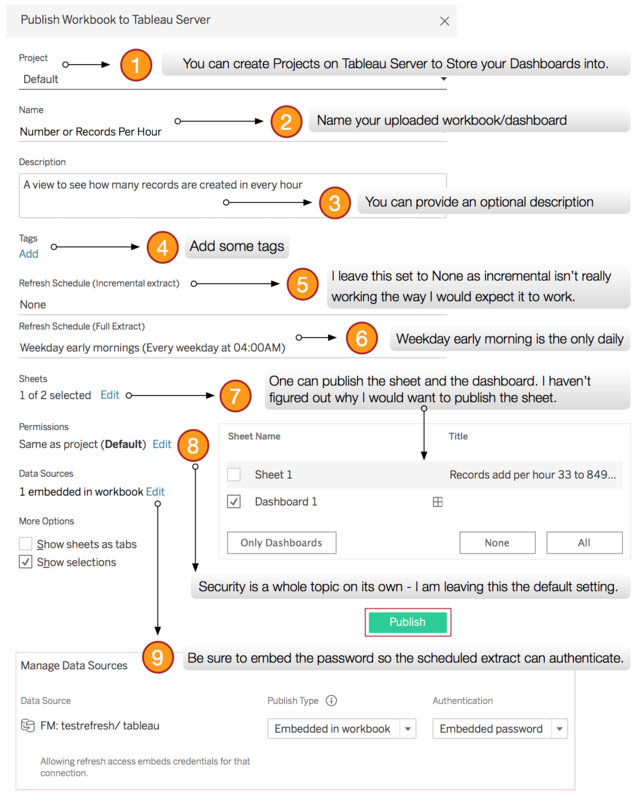 I’ll show you an example of automatically extracting all the data on a daily basis. For this example, we’ll do it each day at 4:00 AM, which is the most common extract schedule to use. The first step in publishing your dashboard is connecting to your Tableau server. In Tableau Desktop, from the Server menu, choose ‘Sign in’. You’ll then be prompted to enter the address of your server. Then click ‘Connect’ and authenticate. I added the steps and notes. Note that some of the popovers seem a little off — it just takes getting used to the fact that there is no button to accept the changes you make in the popover widow. It’s a little bit like FileMaker — you just click outside the box to save those values. 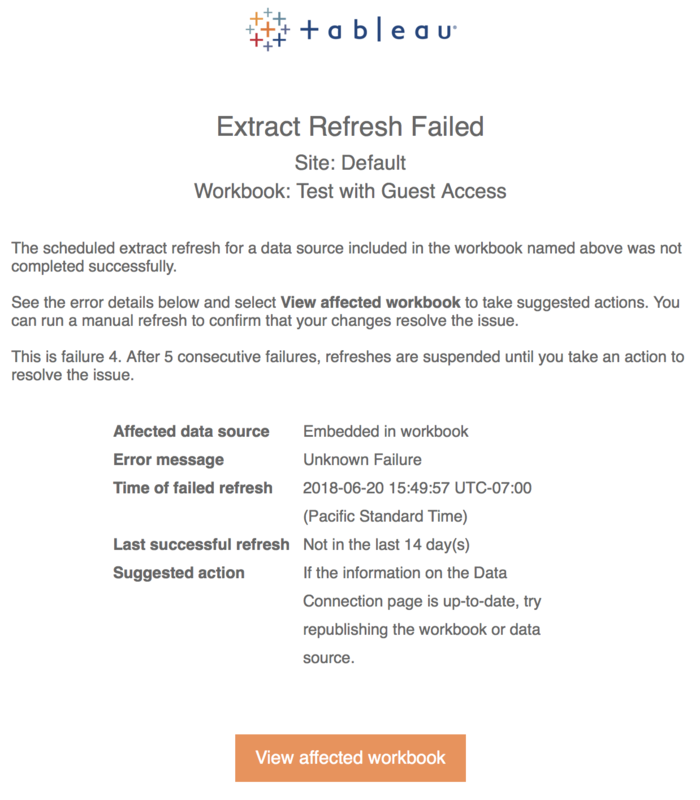 Item 9 – It’s important to embed the credentials into the Refresh schedule, otherwise the background process will not have the information necessary to log in. You’ll see that it navigates you to your browser and provides a confirmation. Now you are probably thinking: I’ll just wait and see what happens at 4:00 AM. But you don’t have to be bleary-eyed to confirm that your extract schedule is going to work. In Tableau Server, under ‘Refresh schedules’ (right next to Full refresh) click on the “ … ” and choose ‘Run Now…’ from the drop down menu. The refresh will be scheduled. And, then you will receive this dire-sounding email—but don’t be discouraged! The reason for this failure message because you still need to whitelist the data source you’re using. You can do this using some simple command line wizardry. The Windows Tableau server uses a CLI command named ‘tabadmin’ to manage the server. The Linux-based Tableau Server uses a similar command, but named ‘tsm’ (Tableau Server Manager?). Note that whichever server you use, the whitelist entry must define a ‘secondary whitelist’, which is used to specify the domains this data connector is allowed to access. Once you have whitelisted your Web Data Connector, then you are off and running. The refresh runs like clockwork. Thanks for following along, and trying this out. In some future posts I plan to look at more cool things you can do, like data-driven alerts and other useful ways that you can integrate Tableau and FileMaker. Stay tuned!